The peptide sequence ERMRPRKRQGSVRRRV corresponds to pseudosubstrate region of the e-isotype of protein kinase C (PKCe) with an alanine to serine substitution. PKCe exhibits an apparent specificity for the native peptide (Km = 68 mM). Ref: Schaap, D. and PJ. Parker, J. Biol. Chem. 265, 7301 (1990); Schaap, D. et al. FEBS Lett. 243, 351 (1989). 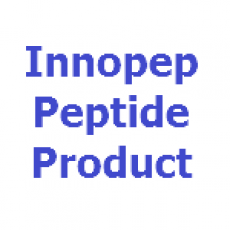 InnoPep Inc. is a company started by a couple of researchers with decades of expertise in peptide synthesis and conjugation aimed at enabling. Stay Updated With Our Latest Products. Copyright © 2012 - 2019 InnoPep. All Rights Reserved.